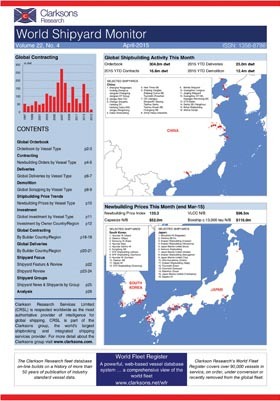 World Shipyard Monitor is the monthly shipbuilding report the shipyards use. It's also essential for shipping investors, equipment manufacturers and forecasters who need the facts about ship supply. World Shipyard Monitor is designed to provide a clear 'at a glance' insight into the supply side of the shipping industry. The orderbook, contracting and deliveries at over 600 shipyards are updated monthly along with analysis of shipyard capacity. Well laid-out tables, graphs and listings show the reader who is building the ships, and what the level of newbuilding investment is, as well as the details on individual contracts. World Shipyard Monitor is also available on World Fleet Register and Shipping Intelligence Network.